Blogging about life, death, virtue, and love. Meet Celeste. Her name means “Heavenly”. 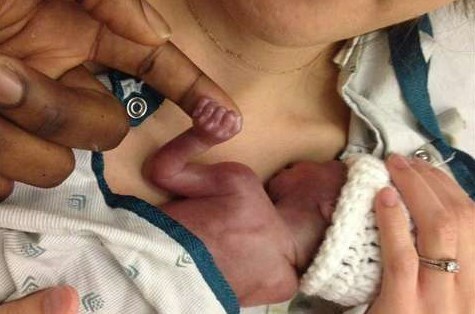 This was a fitting and perfect name for a child born at 22 weeks weighing one pound, one ounce. About a month ago, Corinna began experiencing contractions at 22 weeks in her pregnancy. Her husband Kemi rushed her to the hospital where doctors informed them the baby was coming. Doctors tried tactics to delay the labor hoping to extend delivery to 24 weeks where babies are more able to survive outside the womb. Celeste was eager and nothing could stop her. My husband Doug arrived at the hospital a few hours before delivery to comfort and support his best friend (and God-father of our daughter) Kemi and his wife Corinna. I arrived about an hour later and entered the hospital with my phone in my hand receiving a confirmation to a text that I sent two of my priest friends urging them to rush to the hospital and to be prepared to baptize. I entered the hospital room prior to labor and hugged Kemi tight and then I went to Corinna in her hospital bed and made the sign of the cross on her forehead and told them I would be in the lobby storming heaven with prayers and that a priest was on his way. Doug and I sat with Corinna’s family and Kemi’s brother Ike as we anxiously awaited news. We were praying feverishly that either Celeste would stop her pursuit of being delivered early or that God would make her lungs develop enough to live a long life. There was a sense of somber helplessness and at the same time, trust and hope. Corinna’s mom received a text that things were in motion, meaning Celeste was on her way. The family left to wait outside of Corinna’s room while my husband and I stayed in the lobby praying. Minutes later, Fr. Muir, my dear priest friend and friend to the family, entered the hospital alongside Corinna’s original doctor (who did not have privileges at this hospital but came to offer support). Their timing couldn’t have been more perfect as Celeste was born soon after and baptized Catholic by Father within minutes of her birth. 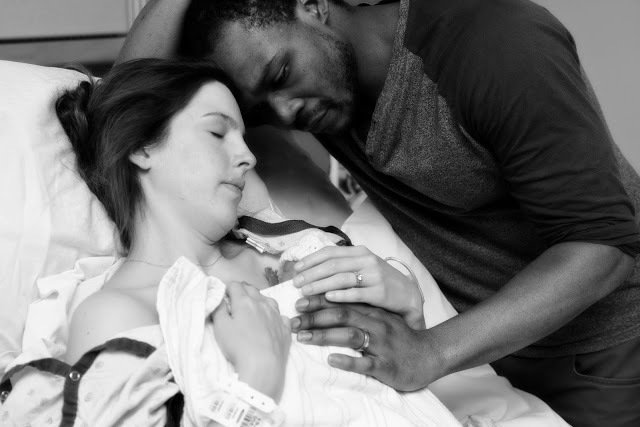 While Corinna was delivering, her family, Ike, and Doug were in the hallway crying, praying and holding each other tight; it seemed as if everyone was holding their breath to hear the outcome. I was in the back and dropped to my knees begging the Lord for a miracle. The doctor came out with a look of sadness knowing from experience what was likely to happen next. He told us Celeste was born one pound, one ounce, was breathing, was even a little feisty and was now laying on Corinna’s chest bonding. I asked the doctor if there was a chance for the baby to survive and he shared that the baby would probably live for another hour. My heart sank, but I held on to hope! They invited everyone in the room to meet Celeste. I saw a glimpse of the small and beautiful child and was awestruck by the love Corinna and Kemi were giving her. They were whispering sweet words in her ear and were looking at each other expressing their love for one another. Their affection was palpable! They loved Celeste, caressed her small body, all the while comforting one another knowing what was to come. They invited a photographer to come and take family photos to capture their time together. Their other daughter, Evie, who is almost one year old, joined them for the pictures. We all left them to have their time together and the nurses were nice enough to open the room next door for us to congregate. It was hard. On one level their baby was born alive and we wanted to be happy, but there was a cloud of reality that she may not be with us for long. After a few hours, I left the hospital to relieve my mom from watching my children since it was late. My husband stayed there to be with the family. Doug told me that the doctors made Corinna leave for a surgery to remove her placenta and Kemi, Ike and Doug were left in the room showering Celeste with love and affection. Kemi stepped out to check on Corinna and Uncle Ike was affectionately caressing Celeste’s back. Doug moved in close to Celeste and said the phrase we say to our children. He said, “You are unrepeatable, irreplaceable, and unique and the day you were born the world changed for the better because you are in it. There never was or ever will be anyone like you because you are special.” Both men sobbed knowing that this beautiful human being weighing one pound, one ounce would soon be in Heaven but never forgotten on earth. Celeste survived outside of Corinna’s womb for three beautiful hours. She was loved completely, totally, and fully for the entire 22 weeks and 3 hours of her life. And, she will continue to be loved as she spends eternity in Heaven. My husband was right when he whispered in her ear, “The world changed for the better because she was in it.” Although her time was short, Celeste was a game changer in this world. Her short survival showed her humanity at a stage where many want to ignore it exists. She showed us that whether you live three minutes, three hours, three years, or 103 years, each person deserves to be loved and shown dignity at every stage of their life whether born or unborn. Celeste Chineye Ndolo was born 2-12-2013 at 7:47 pm and passed away at 10:45 pm. We got to hold her for 3 hours before singing her to sleep for the first and last time. Corinna and I want to thank everyone for praying and remembering us yesterday through our little adventure. Corinna and I like to think of life as a series of little adventures leading up to the final time when we get to go home. Our little girl is home. Today is our 3 year wedding anniversary and what better way to celebrate love than with life. Celeste wasn’t here for long, but she was here long enough to be loved perfectly by us and you all through your prayers. And now she’ll be praying for us all until we see her again. If she’s anything like her big sister Evie, she’ll be standing when God tells her to sit, singing when God wants to be napping and giggling in God’s arms. Again we can’t thank you all for your prayers and consideration. We love you all and consider you family. 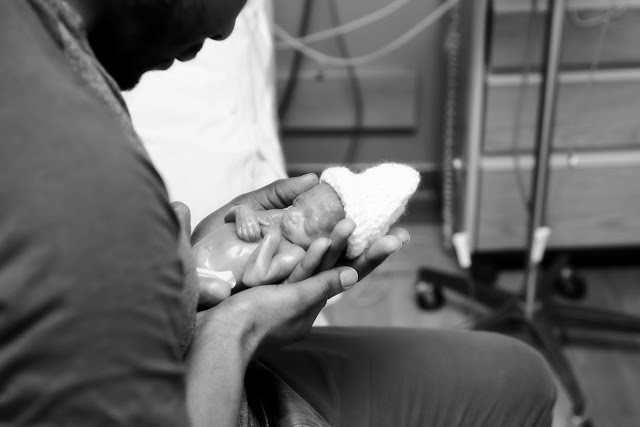 Kemi and Corinna demonstrated heroic love as they tended to their baby girl from her conception until her natural death. Their love was pure and sacrificial even while they were in pain and heartache imagining what was to come. Celeste was fully human and fully alive in the comfort of her mother’s womb and she continued to be fully human and fully alive at her birth at just 22 weeks. Abortion takes the life of a fully human and fully alive child and can be done throughout all nine months or all 40 weeks of pregnancy for any reason in America. Celeste is evidence that life is valuable and every human life deserves to be treated with respect from conception until natural death. Let us pray that Celeste’s short life and these pictures of pure heroic love impact the culture of death. Let us pray that mothers who are opting for abortion, see the face of Celeste, and walk out of Planned Parenthood’s deceptive arms and into the loving arms of pregnancy centers that will honor them with truth and help in their situations. Let us pray for those in crisis pregnancy situations that they will see the tiny hand of Celeste clasped around her father’s finger and choose the heroic love of selecting life for their unborn child. Let us pray that the face of Celeste is the very thing that prompts lawmakers, especially our president, to stop the atrocity of abortion that is ending innocent human life in the name of convenience. Let us pray that the face of Celeste is the Heavenly reminder to women who have aborted their babies that God loves them and desires to forgive them. Let us pray that post-abortive mothers see the face of Celeste and have the courage to contact Rachel’s Vineyard or Silent No More to reach out to other women who have experienced the pain and heartache abortion causes women. And finally, let us pray that Celeste will be a reminder to all of us that life at all stages is precious and not to take a moment for granted with the ones we love. And, even when we experience painful circumstances or heartache that we would choose to love in even more heroic and selfless ways! You can view Corinna’s blog where she wrote Celeste’s Birth Story at http://ndolofamily.blogspot.com/2013/02/celestes-birth-story.html. I’ve talked to some women from Silent No More, it’s so heart breaking to hear their stories. As a society we need to support women so they don’t feel coerced into abortions. So sorry to hear this! My heart aches for you! May the Lord comfort you and bless you with his abundant grace! I am 22 weeks pregnant today and my heart aches for this family and you also Carla. I am so glad God gave them 3 precious hours. She looks so perfect. I pray that God blesses them with another full term healthy baby. Let others know you like the book! I was at a garage sale with my toddlers. Let Your BODY Speak a Language of LOVE Through CHARITY! I’m a “DIY” Kind of Girl! Newtown, Connecticut: What can we do? Have You Thanked a Nurse Today? Things Have Been a Whirlwind! 700 Club Will Air My Story Tomorrow! What Does Your “Yes” Mean?